Gun-control advocates insist that we must ban “assault weapons”. They say these deadly killing instruments have no place in the hands of civilians. They are certain we must ban assault weapons, but they’re usually unclear about one thing: what is an assault weapon? I don’t know what it is, but I know we need to ban it! It must be bad, because it’s called “assault”. It must be bad, because it looks like an army gun. It must be bad, because you can shoot it over and over. Those are all bad things, right? And because it’s so bad, it must be especially deadly, right? What are the features that define an “assault weapon”? The gun on the left has been legal ever since it was introduced in the early ’70s. The gun on the right was illegal during the 1994-2004 federal assault weapons ban, and remains illegal today in California. Yet these are the same gun! They work exactly the same, shoot the same bullets, take the same magazines, and have all the same working parts. The difference between the guns above is that one is wood and the other plastic, the stock is shaped differently, and there is a flash suppressor added to the front of the black gun. Essentially these are cosmetic changes and the two guns work the same. When people say “military style”, they might really just mean style. Too deadly, you say, with one shot for each trigger pull? Is that why we must ban it? The problem there is this: except for some high-powered hunting rifles, shotguns, antiques, that is how almost all guns work today. And for many years. The first repeating weapons were introduced in the 1800s. 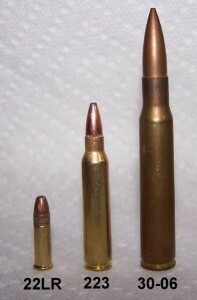 On the left is the .22 long rifle cartridge. This is one of the smallest (and one of the oldest) rounds used today. It is used in the Olympics and other competitions, and is suitable for hunting small game like rabbits. The middle round is the .223 caliber (or, in NATO terms, 5.56 mm) used in the rifles shown above. It is a medium-power round that is used by the police and the armed forces, and is just about suitable for hunting deer and wild pig — it is not legal for this purpose in some states that consider it too underpowered. The round on the right is the 30-06 (pronounced “thirty ought six”) adopted by the army in 1906 and widely used in hunting and sniping rifles. You can see that it dwarfs the .223 round next to it, and the ballistics are consistent with the visual impression. It’s a properly powerful round, though still too small for really large game like elk or grizzly (yes, people shoot those). In the US each year, around 2⁄3 of homicides are commited using a firearm. Of those, less than 5% involve a rifle, and only a fraction of those are so-called “assault weapons”. So perhaps 0.5% of homicides — that’s one out of hundreds — are committed using these soon-to-be-banned weapons. That’s less than 1/10th of Japan’s homicide rate; that’s way lower than any other country in the world. It is true that in several high-profile mass killings, weapons of this type were among the many used by the criminals. Yet this style of weapon accounts for almost none of the killing in America. In Chicago in 2011 there were 362 murders: just ONE of these used a rifle. It’s not because they are semiautomatic. Aside from some hunting rifles and shotguns, virtually all other guns today are repeating weapons of one sort or another. It’s not because they are powerful — they are not. The .223 round used in the AR-15 and similar rifles is only moderately potent as rifle cartridges go. It’s not even legal for deer hunting in some states, because it is too underpowered! It’s not because they are “military style”. Or at least we should hope not. A gun is not more dangerous because it is made of black plastic. Of all the killings in the US, only one in hundreds involves one of these so-called “assault weapons”. Could it actually be that gun-control advocates want to take whatever guns they can get? That “assault weapon” is actually a slick phrase used to sell gun bans? After they ban the black plastic “military-style” guns and nothing changes, will they be back for more? You bet they will. Sometimes you will hear someone say “Sure, people have a right to own guns… but nobody needs an assault weapon!” The next time you hear this, try asking that person what they mean: they probably don’t know. They’ve been sold that line. Just found this, better still: The Truth About Assault Weapons.